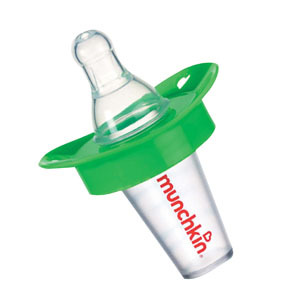 This clever medicine pacifier is the best-selling liquid medicine dispenser in America. Designed by a pediatrician, this dispenser bypasses baby's taste buds so there's less spitting up and gagging. It proves a spoonful of sugar isn't the only thing that helps the medicine go down. With accurate calibration, controlled dosaging and safe flow rate, Munchkin the Medicator does the job - and does it well! Safe, easy, and accurate way to dispense liquid medicine. Medicine bypasses baby's taste buds reducing gagging and spitting up.